The Lady Bird Lake Hike-and-Bike Trail is a 10-mile (16-kilometer) route that creates a complete circuit around Lady Bird Lake. Not only is it one of the oldest hike-and-bike paths in Texas, it is also the longest non-motorized traffic trail. Every year, this trail sees over 1.5 million visitors, most of whom run, walk, or bike around the loop. It is a great way to stay fit and release stress during your travels. You can even choose a short segment of the path to go around if the full 10 miles is too long for you. 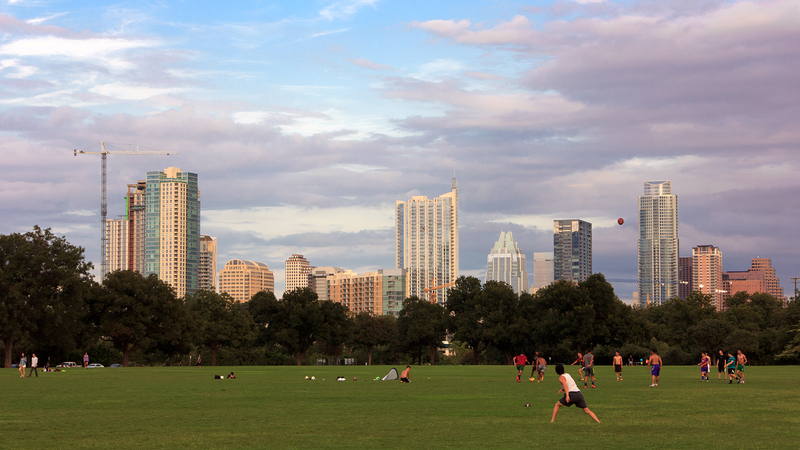 Known as the crown jewel of the city’s parks system, Zilker Park is the city’s most popular park. Even though it is not the largest park in Austin, it is known for hosting several major festivals (such as the Austin City Limits Music Festival and Zilker Park Kite Festival) annually. When the weather is sunny, Zilker Park is the ideal setting for a picnic. Pack some sandwiches and drinks, and head out there with your friends or family. It’s always fun to just sit around and do nothing for a couple of hours. Several points of interest within the park include Austin Nature and Science Center and Zilker Hillside Theater, as well as the next three suggestions below. Zilker Botanical Garden features a collection of 13 independently maintained gardens, each with its own theme (e.g. Cactus and Succulent Garden, Isamu Tanigushi Japanese Garden). Consisting of native trees, natural grottos, and colorful flowers, it is known as the centerpiece of Zilker Park. Perfect for visitors seeking tranquility, you could easily spend hours exploring each garden without even realizing it. Located in Zilker Park, Barton Springs Pool is a recreational outdoor swimming pool, fed with natural water from the underground Barton Spring. Because it maintains a stable temperature of 20 degrees Celsius (68 degrees Fahrenheit) during summer and winter, it is a popular place for swimming all year round. Surrounding the pool are grassy patches for visitors to lounge on if they don’t wish to swim. Note that the pool is closed for several weeks once a year for extensive cleaning, so be sure to check that it is open on the day you’re going. The Umlauf Sculpture Garden and Museum is an outdoor sculpture garden adjacent to Zilker Park. It primarily features works of American sculptor Charles Umlauf (including his most famous work ‘The Kiss’), but also houses several temporary exhibits from other artists. With over 100 sculptures surrounded by lush greenery, it is the place to go for quiet. Take slow deep breaths and truly enjoy the rare moment of peace you can get in the city. Austin is a city known for its eclectic nature. What better way to highlight this than with a pile of junk? The Cathedral of Junk is located in the backyard of a small house in south Austin. A subtle sculpture that blends in with the neighborhood, this now-famous landmark was never intended to be built as an attraction. It is estimated to contain over 60 tons of junk, most of which was brought to the creator, Vince Hannemann, from other people. Wander through the junk mass, see what you can find, and don’t forget to embrace the weirdness. Dedicated to telling ‘the Story of Texas’, the Bullock Texas State History Museum is one with all things Texas-related. Not only is it home to the state’s largest IMAX theater, it also consists of 3 floors of interactive exhibits, each with a theme (land, identity, opportunity) that holds its own tale about Texas. As a former independent republic, Texas has a unique culture and history that the locals are extremely proud of. In front of the museum is a giant star to represent Texas’ nickname of ‘The Lone Star State’. Even if you are not from Texas, you will feel the spirit of Texas by the end of your visit to the museum. With theaters in 22 locations all over the US, Alamo Drafthouse Cinema is a cinema chain founded in Austin in 1997. It became famous for enforcing its strict policy on proper behavior and etiquette in the theater. Even though its original location in downtown Austin has closed, there are still 6 branches in the city. The films featured in the cinema include new movies, revivals, classics, and movie marathons (e.g. Lord of the Rings, Harry Potter). Get the full experience of enjoying film, food, and drink all from one seat. But don’t forget to check the schedule to find out what movies they are currently playing before visiting. Texans love their barbecue. So you can’t visit Texas without trying their local favorite dish. Austin specifically is known for its Central Texas-style BBQ, which involves rubbing meat with spices and cooking over indirect heat from pecan or oak wood. Visit Franklin Barbecue, the most famous barbecue joint in Austin. But be prepared for long lines, as people start waiting up to 1 - 2 hours before the restaurant even opens. So get there early because the restaurant closes once they’re sold out. If you are not prepared to stand in line for hours, check out La Barbecue instead. There will most likely be a line there too. But you can call ahead to place a to-go order and avoid the long wait. Don’t forget to order their signature chipotle coleslaw side while you’re there! With an elevation of 780 feet (237.7 meters) above sea level, the vista at the peak of Mount Bonnell provides a great view of Austin city and Lake Austin, especially during sunset. The only way to get there is to hike up the mountain. But don’t worry, you have 2 options, and both routes are short and easily doable. You can choose to climb up around 100 steep steps, or walk up a consistent mild incline. If that still doesn’t convince you, think about it as a good workout with the reward of an amazing view at the end. Crossing over Lady Bird Lake, the Congress Avenue Bridge is home to the largest urban bat colony in the world. In the summer, around 750,000 to 1.5 million Mexican free-tailed bats reside there. The bats usually emerge daily at dusk, and they can be seen from the bridge or the lakeside. If you have never eaten from a food truck before, you’re missing out. But here’s your chance. Austin is a city that runs on food trucks that are primarily located in food trailer parks. These trucks are a great way to sample a variety of dishes from the city’s diverse culture, from the classic barbecue, to Chinese food. They are also typically extremely inexpensive, making them perfect for a budget traveler. Some of the most popular food trucks in Austin are Micklethewait Craft Meats for its signature BBQ brisket, East Side King for its fusion of Asian culture and Austin’s laid-back vibe, and Hey! You Gonna Eat or What? for its homemade sandwiches (particularly the Shiner Bock Monte Cristo). The Texas State Capitol provides free tours for all visitors to learn about the building, Texas history, and Texas legislature. The tours depart every 20 -30 minutes and last for approximately 30 minutes. They even offer specialty-themed tours (such as Women in Texas’ History, Heroes of the Texas Revolution etc.) on specific days and times. This is the place to go if you are curious about the state. Seating close to 2,500 people, The Oasis (also known as ‘The Sunset Capital of Texas’) is not only the largest restaurant in Texas, but also one of the biggest in the world. Located on a cliff 450 feet (137 meters) above Lake Travis, The Oasis features a large outdoor terrace that makes it the perfect place to watch the sunset. Enjoy the shimmering streak of light as the sun reflects on the lake with some food and drinks. It makes for some amazing photos, so don’t forget to get your camera ready. The Lyndon Baines Johnson Library and Museum (or the LBJ Presidential Library) is one of the 13 Presidential Libraries in the US. It houses 45 million pages of political documents, including papers of Lyndon Baines Johnson. However, what makes this library / museum unique is the replica of the Oval Office housed on the top floor. At 7/8 of its original size, this model is decorated to look identical to the way it did during Johnson’s presidency. Becoming the US President is pretty much an impossible feat, but no one’s stopping you from pretending when you step into this reproduction of the Oval Office. Get a true southern experience in Austin at night at Broken Spoke, a honky-tonk dance hall that has hosted famous country artists since 1964. The place features live music, two-step and swing dances, and some classic southern food (i.e. beer and chicken-fried steak). Don’t worry if you have never danced before. Lessons are taught every Wednesday through to Saturday, from 8:30 pm to 9:30 pm. So get out there, cut loose, and have some fun. Located along Lake Travis, Hippie Hollow Park sits on a steep and rocky slope with spectacular views of the lake. It is the only official clothing-optional public park in Texas, which means all visitors must be at least 18 years old to enter. It is a popular spot for sunbathing and swimming. It is your choice to bare as much as you want, but only visit if you are comfortable with seeing a few naked bodies around. Graffiti Park at Castle Hill is an urban art masterpiece. This series of graffiti-covered walls perfectly captures the uniqueness of Austin. People are free to express anything they want, whether it is a social statement or a beautiful painting. Bring your own can of spray paint if you want to contribute to the colorful murals. Even if you aren’t up for showcasing your artistic talent, the walls are worth a visit and make for interesting photos. Just 30 miles (48 kilometers / around a 45-minute drive) away from downtown Austin is the Hamilton Pool Preserve, a natural grotto carved out of limestone. With a small beach and a 50-foot-high (15-meter-high) waterfall, the preserve creates a perfect backdrop for a relaxing swim. Take a dip to cool off on a hot sunny day, or float around and admire the beautiful sky. The refreshing feeling is almost unbeatable. But note that the area is sometimes closed due to high bacteria levels and reservation is required during the peak season (May to September), so it is best to call beforehand. Because Texas was once a part of Mexico, there is an abundance of good Mexican food scattered all over the state. Even if you never get a chance to actually visit Mexico, you will get an authentic taste of its cuisine without leaving Texas. For a quick bite, stop by Torchy’s Tacos, a local chain that serves Mexican street-food tacos. It is known for its unique twists on the traditional taco (e.g. breakfast taco, fried avocado taco). For a proper sit-down meal, go to Fonda San Miguel. With its Mexican-style restaurant décor and modern take on the traditional cuisine, you will get the full experience of a high quality Mexican meal. The Paramount Theater is Austin’s historic performing arts venue, which just celebrated its 100th year last September. It is known for being one of the first examples of theatrical architecture, and it plays a key role in contributing to Austin’s distinct cultural landscape. Even if you don’t particularly want to watch a show, purchase a ticket just to experience sitting in this timeless and elegant theater. It may sound like a waste, but the theater’s interior is so striking that it will no doubt be money well-spent. Known as the ‘Live Music Capital of the World’, Austin has over 100 venues of live music every single night. A trip to Austin would not be complete without enjoying live music. Grab a drink and groove to the beat of the music on 6th Street, the historic entertainment district where most live music venues initially started. Until today, it is the prime area to enjoy music. You can listen a huge range of genres, from jazz to rock and pop. The street is lined with countless bars and large-scale venues that host these live performances for the public to enjoy. Formerly known as Austin Farmers’ Market, the SFC Farmers’ Market hosts four of the state’s largest farmers’ markets every week, but note that only the downtown and Sunset Valley locations are open on the weekend. Each market features an array of stores showcasing local fruit and vegetables, cheese, meat, flowers, jams, honey, and much more. Shop around and purchase some healthy, organic, and fresh foods. And even if you don’t intend to buy anything, just walk around the market to observe how local farmers promote sustainable living (and taste the free samples). Most vendors will only accept cash, so don’t forget to come with enough on hand. For those seeking a luxurious trip, Lake Austin Spa Resort is a little paradise located 22.5 miles (36.2 kilometers / around a 40-minute drive) outside of downtown Austin. This lavish spa resort provides a peaceful sanctuary away from the city for a tranquil vacation. They offer a range of services, such as individual services (e.g. massage, facial), half- or full-day packages that comprises of a combination of several services, or overnight packages (includes accommodation) at their LakeHouse Spa. However, it is an expensive resort, so expect to pay at least 150 USD or more for 50-minute sessions. Located 68 miles (109 kilometers / just over an hour) away from Austin, Becker Vineyards is the perfect spot for a wine-lover. With their complimentary tour, you can walk around the vineyard and explore the process of wine-making. And for a small additional charge, visitors also get to taste a sample of 6 wines and bring home a souvenir crystal wine glass. Don’t forget to purchase a bottle (or several) of unique wines that are only offered there before you leave as well. Austin is a slightly more underrated city among the top US cities (New York City, Los Angeles, Chicago etc. ), but it is not a city to be missed. It has everything the other places have to offer, including amazing scenery, delicious food, and historical landmarks, but it also has its own unique and interesting features. Don’t fear the weirdness that defines Austin. Step into its beauty. Appreciate live music, experience its eccentricity, and admire its unbeatable views.